When this first came out, back in the 60’s, Charles Shultz fought tooth and nail to keep Linus’s monologue in the cartoon. To his everlasting credit, it stayed, and is one of the most memorable parts of the show. Merry Christmas to you all, from all of us at “the Harbor”. May you all be blessed this Christmas and throughout the New Year. on this Independence Day holiday weekend. Does Anybody See, what I see?? There is commentary from NOW and other liberal outlets, about the ad CBS allowed to run for the upcoming Super Bowl, done by Tim Tebow and his mother. That all these folks profess to be “pro choice” when they are anything but, is an understatement of monumental proportions. Personally, I think that “choice” should be up to the individual (and kept at the state level btw), their own conscience, and/or the deity of their choosing. (This is also assuming we are talking about something done within the first month or so after conception, but that is a topic for another day.) Now let’s be serious about it. Real choice should be exactly that, allowing an individual, after having all the facts given to them, about the positive and negative outcomes of any option taken, being allowed to freely make their own intelligent decision, based on those facts. Sounds like that is what Tebow’s mom did all those years ago. And so did another, much less famous, but just as heroic woman. Her story is here. And yes, I know exactly how Tim Tebow feels. And there were in the same country shepherds watching, and keeping the night watches over their flock. And behold an angel of the Lord stood by them, and the brightness of God shone round about them; and they feared with a great fear. And it came to pass, after the angels departed from them into heaven, the shepherds said one to another: Let us go over to Bethlehem, and let us see this word that is come to pass, which the Lord hath shewed to us. And they came with haste; and they found Mary and Joseph, and the infant lying in the manger. And seeing, they understood of the word that had been spoken to them concerning this child. And all that heard, wondered; and at those things that were told them by the shepherds. From all of us here at “The Harbor”, A Very Merry Christmas and the Happiest of New Years!! Normally, this would be the time of year to put aside thoughts pertaining to politics, specific acts or actions of those with evil on their minds or in their hearts, and other secular items not considered part and parcel of the season. This would be the time to reflect and rejoice in the most special and divine gift bestowed upon all mankind, by a loving and gracious Father. Even those who profess to be agnostic or atheist, are able (if they so choose) to pause and reflect on the more noble and honorable aspects of the human condition, perhaps to be of a mind to improve the lot of their fellow man, by willingly embracing the (proper) spirit of the season. Set the stage for their complete take over of the reigns of power, no longer beholding to the “will of the people”. Allow for the public admission that the Constitution as written is nothing more than (a best) “a guideline”, to be followed (if at all) as political expediency may dictate. That this Nation’s “rule of law” is suborned to those laws and ideals as set forth by “the world court” or such agents or agencies controlled by “a world body of governance”. I could find, and provide links to any and all of the above. But you (who stop by here) have most likely already read them yourself, if not have linked and commented on same. If you think the “Health Care” legislation proposed by the Congress and or Senate is about health care, think again, it is about nothing more than power and control. If you think “Cap and Trade” is about taking care of, and control of the world wide levels of pollution and placing “responsibility” on those who are most egregiously impacting the environment, think again, it is about money, control, and power. If you think publicly (let alone what may be happening “behind closed doors”) suborning American interests, and American will (to affect positive military and political balance through out the world), to the interests and “wills” of other nation-states/governments, is only about “correcting past injustices”, or allowing for “a world wide level playing field”, think again, power, money, and control, are at the heart of the matter. If all the above is allowed to go unchecked, allowed to continue – even at a slower “RINO like” pace – we are, as a people, as a culture, as a nation, doomed. Depending on what transpires over the next month or two, we may even be too late in bringing about change via the ballot box, starting with the mid-term elections in 2010. To this end, remember the reason for the season. The celebration of the birth of he who ultimately became the ransom for all mankind. That when mankind’s fate appeared to be all but sealed, all falling short, destined for an eternity of enslavement to the debauchery of demons, the Son of God as man, check and mated the designs of Evil. It is His birth, and the hope it allows to spring forth, which men of good will might well want to remember. For despite all which is wrong, in this country, and in the world at large … despite all the evil which men do or are commiting themselves to do. There is still hope. I am of a firm belief this country was, at some level, brought about by divine providence. That the minds of men were, if not directly controlled, were benefited from divine inspiration. This being the case, it is hard to believe, as long as there are men of sound mind and free will in this great land, that we would willingly be brought under the twin yokes of tyranny and oppression. I visit a number of blogs on a daily basis. One of my favorite stops is Pascal’s Fervor. He has acquired a “resident troll”, whose singular ability to ignore direct questions, while spewing forth any number of inane comments, makes one wonder if there is more than one functioning reality on this earthly plane, at the same time. A couple of days ago, (Would have written about this sooner, but some minor -but no less annoying- physical issues, kept me from posting.) said troll posited the following, in response to a post (and associated comments) at Pascal’s home on the web. To be fair, the troll hit on something which could almost be considered a “kernel of truth”. Of course, he took it to the absurd (and incorrect) extreme. However, there was still the feeling of (on my part) this perhaps needs to be addressed in somewhere other than the comments section. So, here goes. First off, we live (despite feminist claims to the contrary) in a Patriarchal society. This has, with few exceptions, been the rule throughout recorded history. This does not mean (nor should it) women are not capable of leading, or shouldn’t lead, only for the most part, men have been the leaders of the majority of sectors within any given society or culture. Having said that, it is not too surprising that throughout this country’s history, the predominate number of movers and shakers were male. 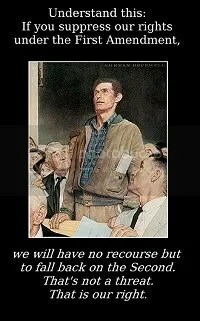 It is our happy circumstance, that our “Founding Fathers” were of a shared wisdom, directed toward a common goal, (which allowed for what might be considered divine intervention) ending in the ultimate production of our nation’s signature documents, the Declaration of Independence, and the Constitution. Is it small wonder we venerate these men, their collected works, and the great nation which has been passed down to us? A partial exception to this might be the strong (and more than proper) adoration of Christians, particularly Catholics, to the Blessed Virgin. However, taking this in context, it could be said this is but the personification of how we should honor and respect our (own) mothers. That the Son of God, made flesh, should place his above all others, should not be too terrifically surprising, and in and of itself does not take away from the Patriarchal nature of the Church, rather it enhances it. A man confident in his own nature and being, would not feel the least bit lessened or “marginalized” (to use some common psychobabble) in properly acknowledging his mother and the part(s) she played in him becoming who he is. Ironically enough, the third “religion” mentioned above, as it is in most of its “teachings and instructions”, is the antithesis of promoting self confidence and self reliance in men. This being the case, it follows they are far less likely to respect or honor women, (be it their mother, or any woman) because they are not given to honor or respect anything (save the darker parts of their nature) or themselves. So is it any wonder, we honor “The Father”, who allowed for his only begotten Son, to surrender himself to the cross, in order for mankind’s ransom to be paid? Nor has this been exclusive to the Christan sects. Even the Greeks, Romans, and Norse mythologies place a “father figure” as the leader of their respective polytheist faiths. That Mr. Troll’s statement at least implies <b>only “cons” place their faith in God, is not only absurd, but slanders those of other political stripes, who happen to (sometimes extremely so) go down a divergent political path, but are to the best of their abilities, as strong and as demonstrative in expressing their faith as any conservative would. To be sure, there are men of all political persuasions who are of a wicked and vile nature. For me to say that all who vote or belong to the Democratic Party are godless heathens who care for nothing else but what’s in it for them, would be just as untrue and as inane, as Mr. Troll’s bit of glibness above. All men, at least at some point in their lives, try to gain a better understanding of their own father (or the man or men, who for whatever reason, were their “father figures”). In so doing, one hopes not just to understand the man, but gain a greater understanding of himself. This is enhanced by attempting to understand, or gain a greater knowledge of, ones God (and the roots/core values of ones religion). Further in working toward understanding the foundations of our form of governance, we complete a triangle of sorts. Placing oneself in the center of the triangle, we seek to develop into a fully functioning, rational thinking, and reasoning being. To head along that path, I would propose you could do far worse than to delve into all three sections of the triangle above, to develop ones own core. This is not the limit to this path of self growth and development, only the beginning. And a constant return to same to reassess and evaluate where you are now, and where you are going, is not a bad thing either. So is it of any wonder the seemingly rudderless and directionaless Mr. Troll is want to mock those who traditionally strive to honor those things which if properly done, stand to strongly make one a better person in the end? I suspect there may also be more than a bit of envy on the part of Mr. Troll as well. But as I do not know him, this is only conjuncture on my part. So, go ahead and call me fixated on Fathers. Call me a mother’s boy. Call me reverent toward God the Father (though I am more than a bit of a backslider from time to time) by openly acknowledging His station. Call me an unbending constitutionalist in my open admiration toward that document in particular, and the Founding Fathers who gave birth to same. As far as I am concerned, you could do far worse in trying to insult me in the above manner. But be my guest. Spring. When we are witness to natures annual rebirth. The cycle of life is shown to continue as evidenced by new buds of grass and flower, along with new young of animals large and small. It is also, if you are adherent to any of the Christian faiths, a time of spiritual rebirth as well. Easter signifies, not only an ending (of sorts), a ransom paid to insure mans passage into a heavenly afterlife, but a new beginning as well. The law of the old testament has been superseded by that of the new. It is considered a time of spiritual renewal/beginnings as well. This being exemplified by the recent activities of his holiness Pope Benedict XVI, baptizing into the faith Magdi Allam, deputy director of Italy’s largest newspaper,who just happens to have been Muslim. It will be interesting to see what repercussions will result from this newest planting in the garden of the faithful. That both converted and converter have displayed admirable amounts of courage in so public an act, speaks highly of both. And not being totally without reflection, I got to thinking about what caused me to come back to the Christian faith. Though past failings, prevent me from returning “completely” to the faith of my birth, accepting there is a God, and as it follows, a son who was ransomed for us all, is not . Fact is, there were many questions I had, most beginning with “WHY”, which turned me from my faith. But some things kept calling me back. I believe in there being a reason for everything and only with the passage of time, have I begun to accept, that though this is true, I am not entitled to know what these reasons are. As is so often said to the “under 21 crowd” living under this roof, “I need to stay in my own pay-grade”. I may not have agreed with everything Dr. Scott ever said. But this has the ring of truth. Its logic is sound. Even if you don’t believe for what ever reason, perhaps if nothing else it will get you thinking. And if perchance, a seed planted, takes root and sprouts … isn’t this the time of year for that after all?